When the mining companies left, so did the jobs, people, and spirit of Cuyuna. For decades, the area was devastated until the community stopped waiting for the mines to reopen and decided to rebuild it in an unexpected way. Today, the town operates a regional mountain biking paradise, stimulating economy and tourism. 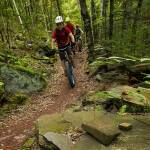 Cuyuna is a silver-level International Mountain Biking Destination and draws 20,000+ riders annually from all over the world to ride its famed singletrack.